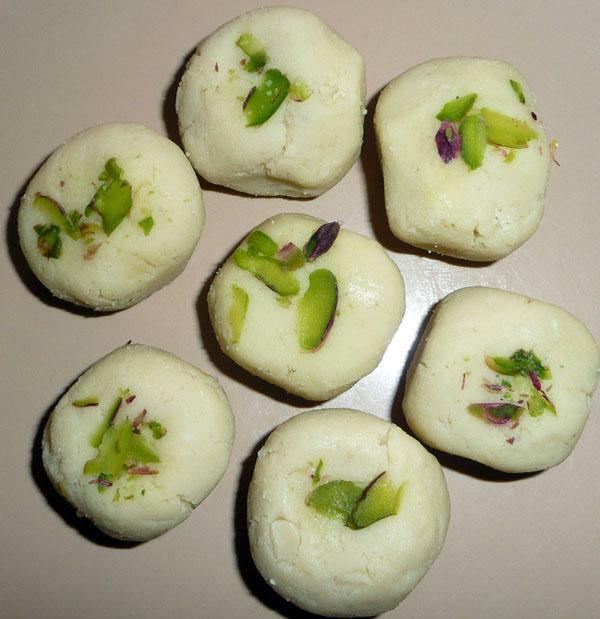 Peda is as popular a sweet as barfi/burfi in India. It is traditionally given as an offering to the Hindu Gods in temples and often used as 'prasad' after prayer meetings. It is a very simple sweet to make, but quite delicious. This recipe comes from my sister in-law's cook Santosh. Her father used to be a 'halwai', an Indian sweet maker and she learnt this dish from him. Makes approximately 30-Mamta. Heat a kadhai/karahi or a heavy bottomed wok. Stir fry mawa, until softened. Add 2 tbs. sugar and continue frying, until mawa becomes thick again and slightly pinkish-brown. Sugar helps to give it the colour. Add and mix rest of the sugar thoroughly, rubbing between the heals of your palms, until you can roll a small portion of mawa into a ball. Divide into 30 portions and make balls. Size is your choice. If you have a peda mould, it is good. If not, use the lid of a small jar, approximately 1 1/2 inch in diameter. Scatter a pinch of chopped almonds/pistachios and 3-4 cardamom seeds in the peda mould/jar lid. Now place one prepared ball into the lid. Turn the lid and the ball over onto a plate; press the mould/lid firmly to flatten the ball. Lift the mould/lid off, leaving a flattened circle of the peda behind. Each peda will come out, ready garnished with almonds and cardamoms. Repeat the process until all balls are finished. Serve at room temperature with tea or coffee. When we were children, our mum used to give us a peda with yoghurt, before we went to take any examinations. It was supposed to be good luck. I suppose it helped because nervous kids often skipped breakfast before an examination and peda and yoghurt gave them a quick boost of energy, along with psychological support - Mamta.